Well, HUGE apologies for neglecting you my dear friends but it has to be said I’ve been quite busy! Where did I leave you? Probably in Manchester just after our Are You Being Served recording. Well, the response from the BBC has been incredibly positive and I can’t wait for you to all see it, last I heard they were going to show all the ‘re-booted’ sitcoms in a season during the Summer (starting in June) but of course that all could (and probably will) change; obviously I shall keep you posted. In other news I’m sorry to say I am LOVING being away from Twitter. I do realise there are a few loyal supporters of my work who miss the interactions but to be free from all the mindless negativity is so wonderful. I feel so sorry for kids growing up today, how on earth do they build friendships and relationships? A friendship is now someone you follow on Twitter and a relationship is a swipe of their Tinder finger (oh dear, Tinder Finger, that just conjured up images I could do without while filming in a sweating Spanish nightclub at 8 o’clock in the morning). But all is not lost; I have ANOTHER website coming soon based around holidays in the Benidorm area and there will be a forum related to that where I shall be very active and we can all have a chat on a daily basis again. More news on that as it comes in…. 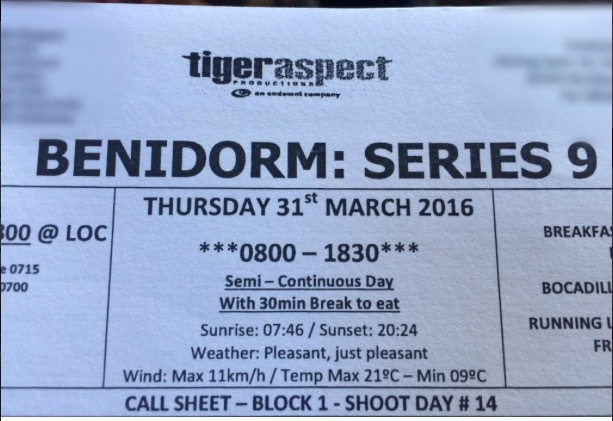 So today sees us shooting in ‘Neptunes’ (Morgan’s Tavern) on the Calle Gerona in Benidorm opposite The Hotel Pelicanos (the fictitious Solana Hotel) on shooting day number 14 (of around 70 in total, I think… I’ll get someone to check on that as I write this). It always seems to be the sunny days we end up filming in a blacked out nightclub, or a fake airport location with no windows, light or air. As I drove to work this morning on my scooter (still very cold traveling at 40km/hr at 7am) I realised this show has been 10 years of my life (TEN years, you only get 7 years for murder!) and my life and career has changed inconceivably. I have life long friends I would otherwise never have met, I live in two different countries (6 months of the year in each), I’m married, I have work prospects far exceeding those when I was only an actor and all of this is a direct result of making up a story about crazy people on holiday in Spain. Is there such a thing as destiny/fate? I doubt it, if everything is mapped out before hand what would be the point of going through the motions? I think we all have potential and a combination of circumstance, desire and luck all come into play to determine how our lives turn out. I once gave Tim Healy’s character Lesley the lines, “talent is like the cream in a bottle of milk, it always rises to the top”. I stand by this with the caveat that someone else usually has no notice the cream to do something with it. Oh dear, I’ve run down a comedy cul-de-sac of arm chair aphorisms; I’ve no idea why I’ve got so philosophical today, oh hang on, yes I do, ten years! And who knows what the next ten years will bring, best to take one day at a time I reckon. Talking of which, a lovely technical person far cleverer than I just rocked up to tell me our shoot here in Benidorm this year is 81 days. That doesn’t include 13 weekends of heavy drinking and out of tune karaoke singing (is there any other type?). One day at a time indeed….